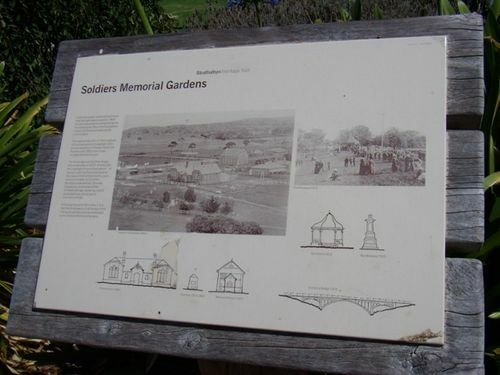 The Soldiers Memorial Gardens were originally a park which was created in 1841. After the end of World War One, the park was dedicated as the Soldiers Memorial Gardens. At the invitation of leading residents of Strathalbyn Mr. J. F. Bailey, the Director of the Botanic Garden, visited the town last week to confer with representatives of the municipal council and others respecting the best means of improving the locality known as the "Peninsula" to make it a permanent place of beauty as a soldiers' memorial park. Mr. Bailey inspected the "Peninsula," and was delighted with its natural beauty. It lends itself to improvement, which would make it one of the beauty spots in the State. He suggested planting flowering trees and shrubs, building rockeries, &c.
Daily Herald (Adelaide), 28 January 1919.